Perhaps I nailed my colours to the mast too soon. So let the excuses begin. 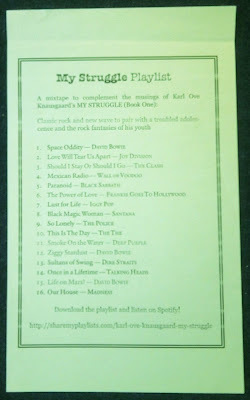 Volume one of My Struggle was sent to me before publication in an ARC minus a title on the spine, well before the serious praise, before the potatohead hype and before the deluge of interviews and features, so I had low expectations, which were then lowered when I found, tucked into the book, a playlist of songs to accompany the reading. 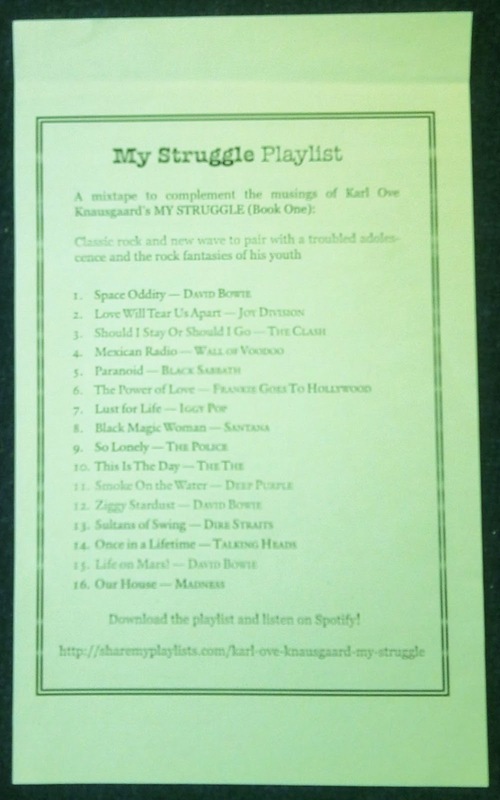 The kind of music liked by most everyone of my generation, for sure, Knausgaard's generation, but not me. So unlike almost everyone else, I began reading in almost pure innocence; to me it was just another book, and so many new books disappoint for no obvious reason, especially novels, and once initial goodwill has been replaced by indifference, the reason becomes obvious: this really is just another book. You recognise in each sentence of most novels the assumptions of the literary form, the opening sentences as prim and confident as a maître d', the reproduction furniture of description and the inexplicable confidence that of any of this is at all necessary. Everything could be different, surely, you think, entirely different, and you wonder why other book bloggers don't think so too and instead put up with what's present long enough to write a review, though when you read them, with their own assumptions of the form, content with the same sentences and the same appeals to the glamour of contemporary relevance and industrial import, you realise in horror and in envy that this is because they are cheerfully free of doubt, fear, disgust, bitterness and anger, what we might call ideas. Such is your penance. But then I found My Struggle begins with an idea rather than the personal details for which it has become famous and I did not want to put it down. The overture discusses how despite being "constantly surrounded by objects and phenomena from the realm of death," we keep them out of sight. This is the maître d' slumping onto a chair. And while this book thereby might be said to bring death to the fore in its excruciating detail, notably in its latter part, there is also, right at the start, right after the overture, the face in the sea little Karl Ove sees on television, something perhaps from a realm other than death, and in itself an idea ghosting into the narrative, or even prompting it in the first place. And then there's the adult Knausgaard's walk at night through a district of Stockholm in which an event seems to impend, because why else give prominence to such an otherwise mundane event? Every corner promises a revelation of some kind, because that's what narration does. But nothing happens. He returns home to bed. I found this to be as confusing and liberating as when aged fifteen I heard the overture to Proust's novel on the radio; there was no action beyond Swann ringing the doorbell. While it suggests a taste for swathes of endless, apparently boring print, it captures instead precisely what I miss most other books: the confrontation of writing with itself, and thereby with what it presents. On the walk, what is present seems to be just out of reach, suspended in the darkness over Stockholm. The distance between narration and its meaning is animated here like nothing else in contemporary literature. The confrontation and distance is also present in the most moving and puzzling passage in volume one, when Karl Ove can't sleep that same night and gets up, moves into the living room and flips through a book of paintings by John Constable. I didn’t need to do any more than let my eyes skim over them before I was moved to tears. So great was the impression some of the pictures made on me. Others left me cold. That was my only parameter with art, the feelings it aroused. The feeling of inexhaustibility. The feeling of beauty. The feeling of presence. All compressed into such acute moments that sometimes they could be difficult to endure. And quite inexplicable. For if I studied the picture that made the greatest impression, an oil sketch of a cloud formation from September 6, 1822, there was nothing there that could explain the strength of my feelings. What's notable here is not only that this is art causing these feelings rather than the actual world but reproductions of art in a coffee-table book, a further compression of the compression he values and a distinct contrast to the expansive quality of My Struggle. Its presence allows a comparison with Marcel's famous experiences compressing time into singularities transcending time. 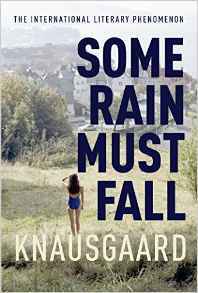 Knausgaard's non-transcendental content acts instead like a sink hole in a dam compressing an over-abundance to reveal or to create a pure and terrifying void (the verb you choose might determine how you respond to his books). In volume one, Knausgaard seems to recognise this when he writes that "strong themes and styles have to be broken down before literature can come into being. It is this breaking down that is called 'writing'." For this reason, I thought volumes one and two could be summed up as a literary embodiment of Weber's disenchantment of the world, the loss of the certainties provided by a belief in God and the communal rituals of observance, but also, and more crucially, the loss of an awareness of loss. While Knausgaard is like the rest of us embedded in rationality and science, his experience of inexhaustibility, beauty and presence in the constraints of art suggested he was aware of something lurking in the shadows cast by the light of modern life that is otherwise dismissed as illusion, delusion and mystification. His novel about angels with the strange, biblical title only encouraged the suggestion. Except now, having read volumes three, four and five, I realise in dismay this might only be a chance product of the melancholic perspective from which the first two volumes are narrated. In the latter volumes, there is straightforward linearity, full of soap opera readability, enabling the same psychological readings or critique from experts of genre that afflicted the initial volumes, only with more justification. Nowhere in volume five does an abyss open without a clear object to plug it, such as Ingvild, Gunvor and Tonje, tormentors of his youthful heart. In volume two, by contrast, the past opens up as he sits on a balcony gazing across rooftops at dusk, so that its compression is foregrounded even as it seeks decompression in that 'breaking down' of writing, for inexhaustibility, beauty and presence to expand into daily existence. A deeper struggle thereby becomes clear. Later in volume two, he finds in Hölderlin's poetry a "lofty, clear and pure light" and in Dostoevsky's novels a light that is "wretched, dirty, sick," thereby offering another explanation for the dynamic of his own narrative. There is plenty of the latter light but the former is perhaps too weak a theme or an effect to sustain over such length and has itself been reduced to a trace of enchantment.